← Do You Wanna See Doñana? Being able to see a different continent from the one you’re standing on is a rare treat. On the beach outside our temporary home in Tarifa, the northern coast of Africa was visible about 9 miles away. 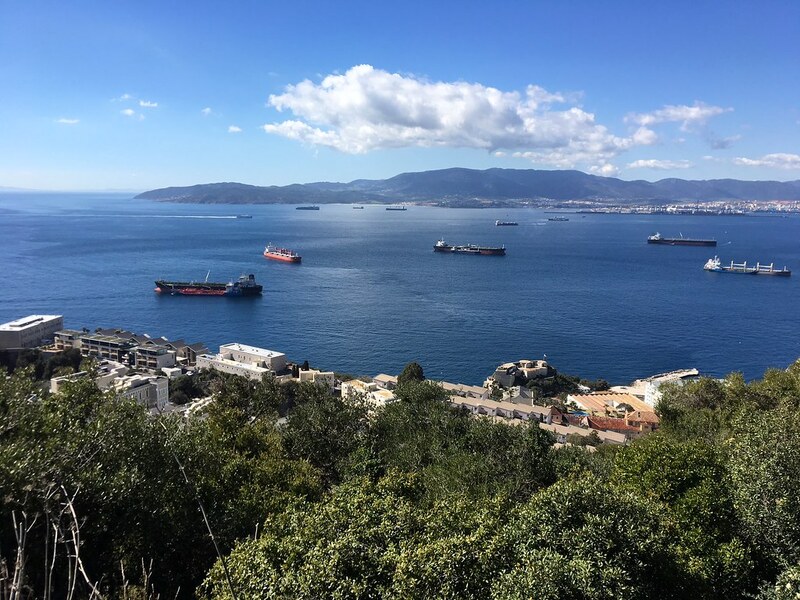 This stretch of water is the narrowest point of the Strait of Gibraltar, which makes it a legendary location for watching migration. 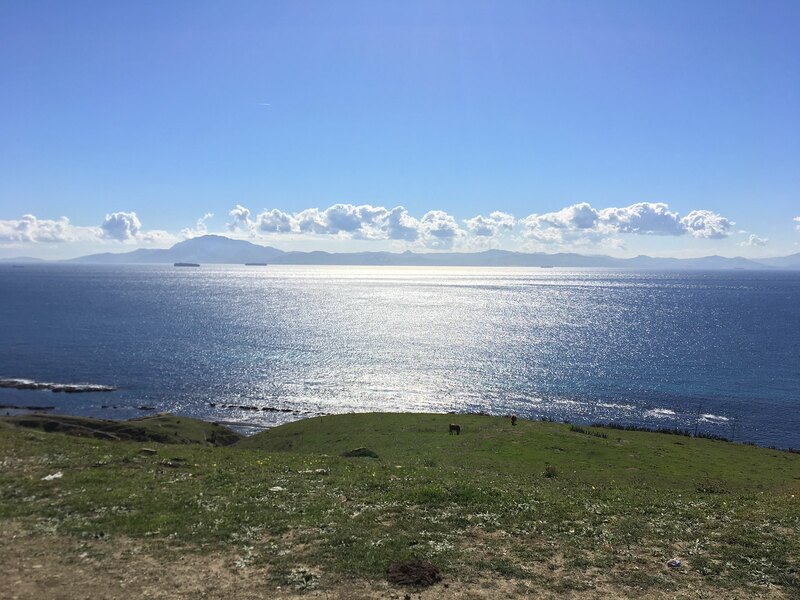 Seabirds and marine mammals moving between the Mediterranean and the Atlantic can be observed from shore with ease, and many species of soaring travelers choose to take this shortcut rather than wasting valuable energy on long over-water crossings. I’d reached out to the naturalists at Centro Internacional de la Migración de las Aves, otherwise known as CIMA, to ask about prime vantage points for getting in on the action. 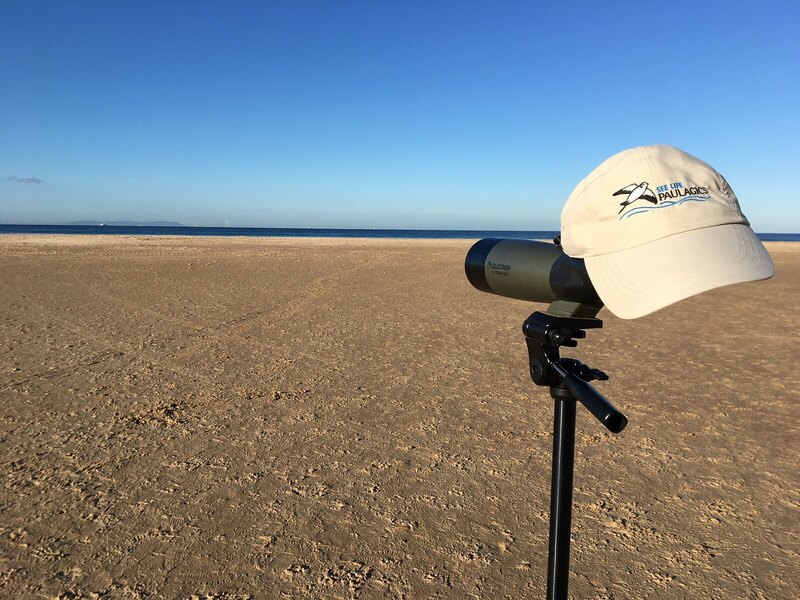 They informed me that seawatching could be rewarding from basically any coastal location in the region, and they also provided detailed information on where to scan for northbound raptors. I awoke to beautiful conditions on Thursday morning, and I immediately set out to try my luck in the field. Light winds and unlimited visibility made for a fantastic morning surveying the surface of the sea. Miriam slept in a bit longer while I checked out the local bird life. Kentish Plovers were immediately apparent scuttling among the Sanderlings, and it was impossible to ignore the throngs of Yellow-legged Gulls. A procession of Northern Gannets streamed by to the west, heading towards the open ocean, and I picked out a few flocks of Cory’s Shearwaters migrating in the opposite direction. A circling Great Skua was a welcome surprise, and there were small numbers of Sandwich Terns on the move as well. I also glimpsed two distant birds rising and falling at the horizon line as they worked their way westward. They appeared to be small tubenoses, but try as I might I could not discern enough detail to confirm their identities with certainty. Even though the expected species is the would-be-lifer Balearic Shearwater, I just don’t feel totally comfortable checking them off with the “views” that I got. I can still hope that the Mediterranean “Scopoli’s” race of Cory’s will get officially elevated one day, though. After Miriam joined me on the beach, we packed our things and headed out of town to the cliffs overlooking the Strait. When we arrived at our chosen watchpoint, we were treated to blindingly gorgeous views of the mid-morning sunlight shining on the sea ahead of Morocco. A few Thekla’s Larks and Goldfinches kept us company while we waited for the large migrants to show up. The day’s movements got off to a somewhat slow start, but by noon we had seen a handful of Short-toed Snake-Eagles making the crossing between the continents. 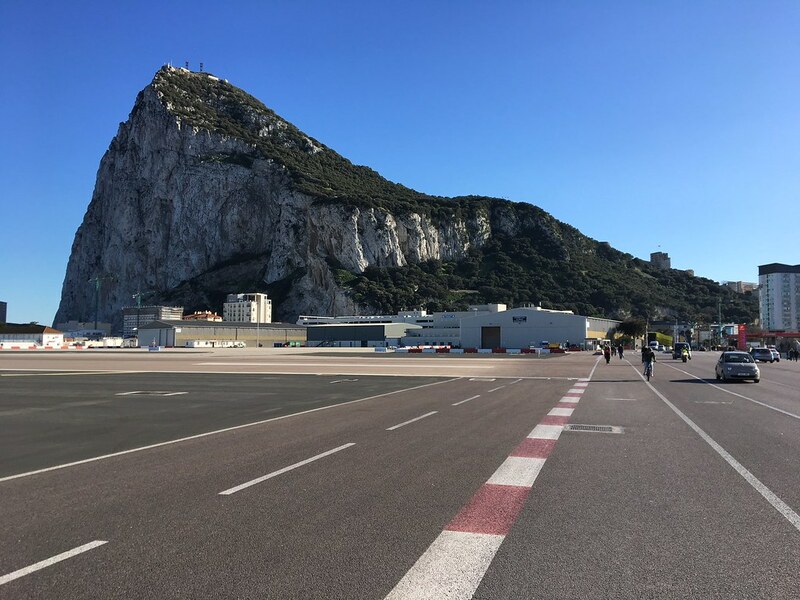 Knowing that it was a bit early in the season to expect jaw-dropping diversity and high counts, we elected to move on to our next stop, Gibraltar. 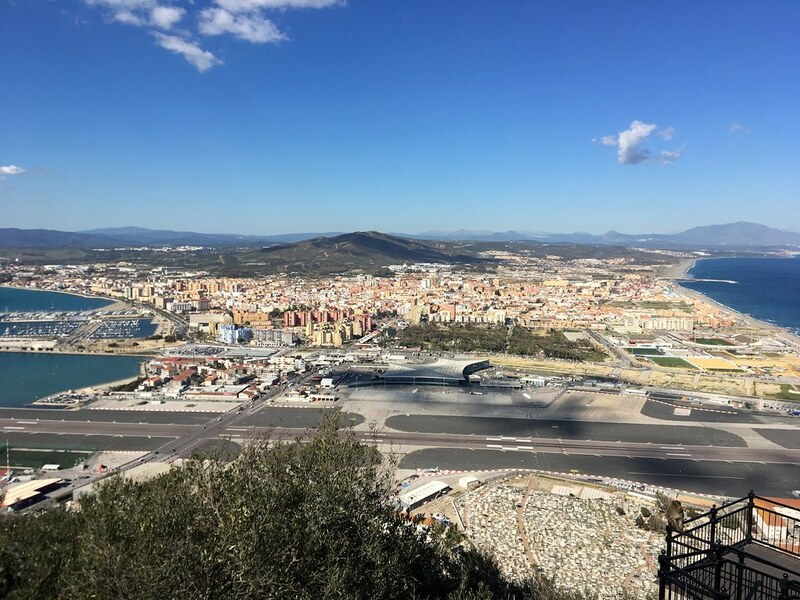 The rental car company, unsurprisingly and understandably, had forbidden us from bringing our vehicle across the international border at La Linea. Word on the street said crossing over on foot was much quicker and easier anyway, so we found a parking spot and passed through customs hassle-free. 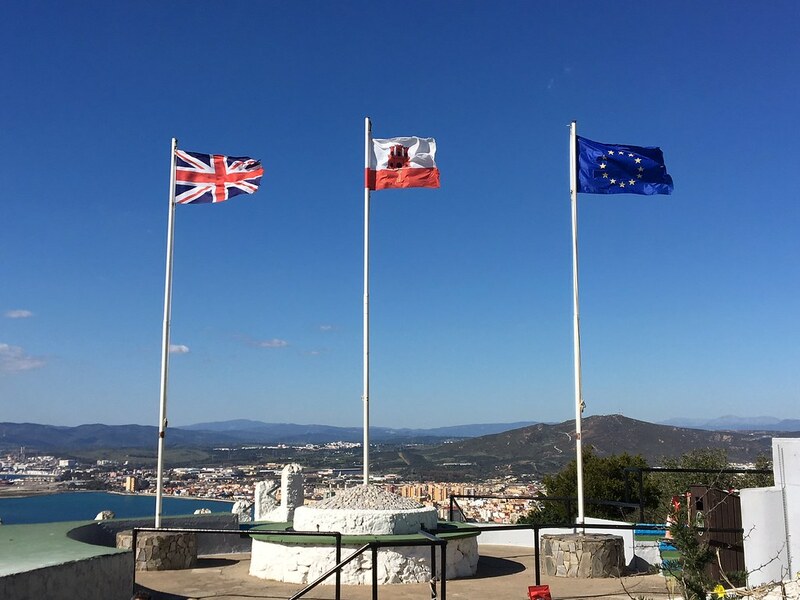 We decided to play tourist for a little while and joined a guided bus trip to the Upper Rock, hoping to get a taste of everything Gibraltar has to offer without spending our whole afternoon hoofing it from place to place. We were not disappointed. Our chauffeur was knowledgeable and entertaining, and the views we encountered were pretty impressive. I kept an eye out for wildlife as we drove along the narrow roads that wind their way up the Rock. Our guide told Miriam that the Barbary Partridge we were looking for are often quite difficult to find, favoring the most natural areas of their only home in mainland Europe. 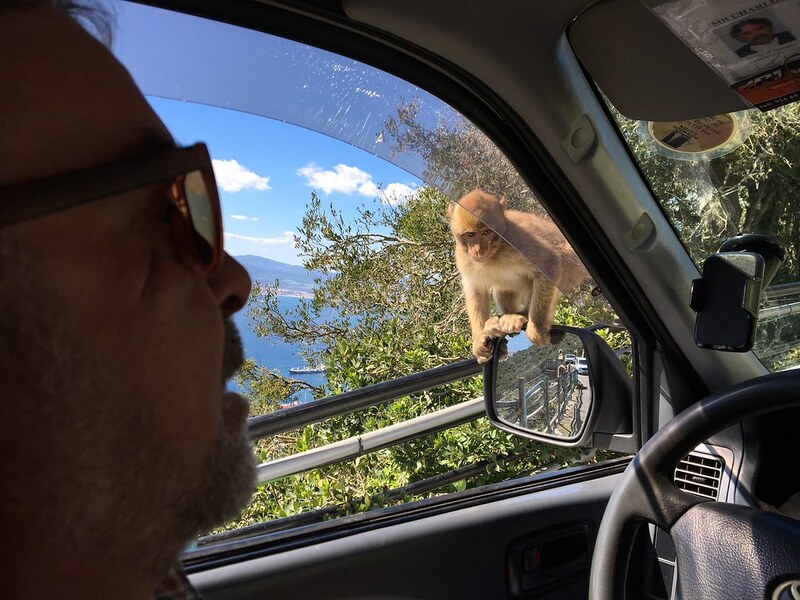 On the other hand, we had no trouble at all locating the best known residents of the territory, the Barbary Macaques. 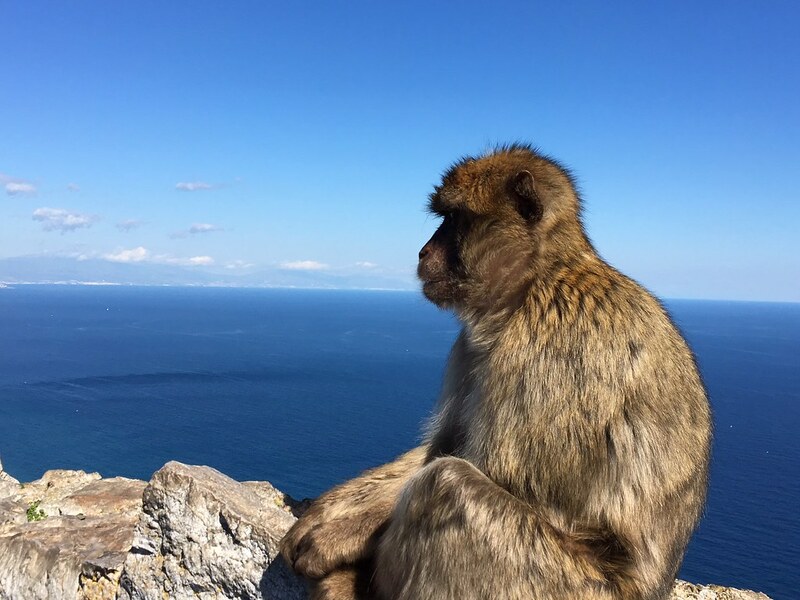 These tailless monkeys live a charmed life in the nature sanctuary above Gibraltar, and they’ve grown quite accustomed to human presence. 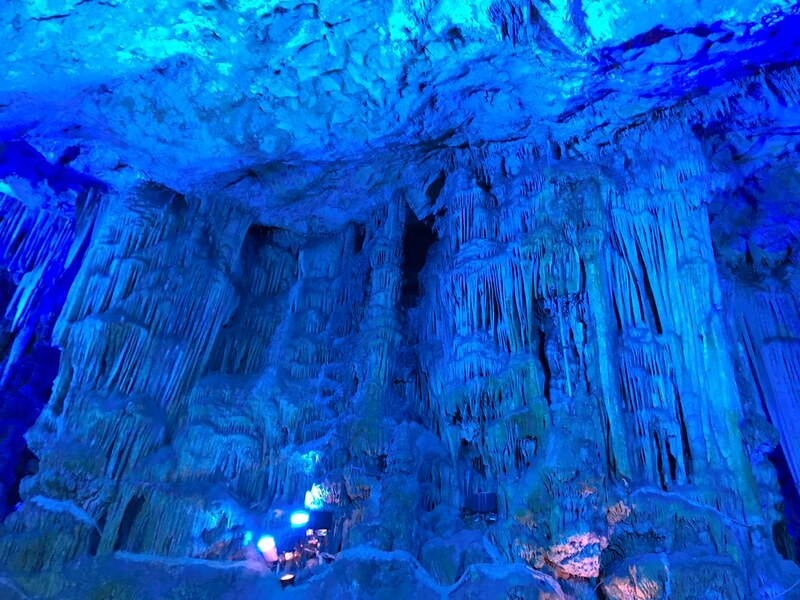 Although origins of the population are unknown, they’ve inhabited the Rock as long as history remembers. Today the macaques probably qualify as semi-wild, unrestrained and free but heavily managed. Food is provided to incentivize staying out of the city proper, and population control methods have also been utilized. Seeing the famous “apes” in person after hearing so much about them was a fun experience. Tour staff repeatedly delivered the common sense warning not to feed or touch the primates, but evidently no one informed them not to touch us. Several individuals hopped aboard to inspect our hair for parasites and our pockets for snacks. 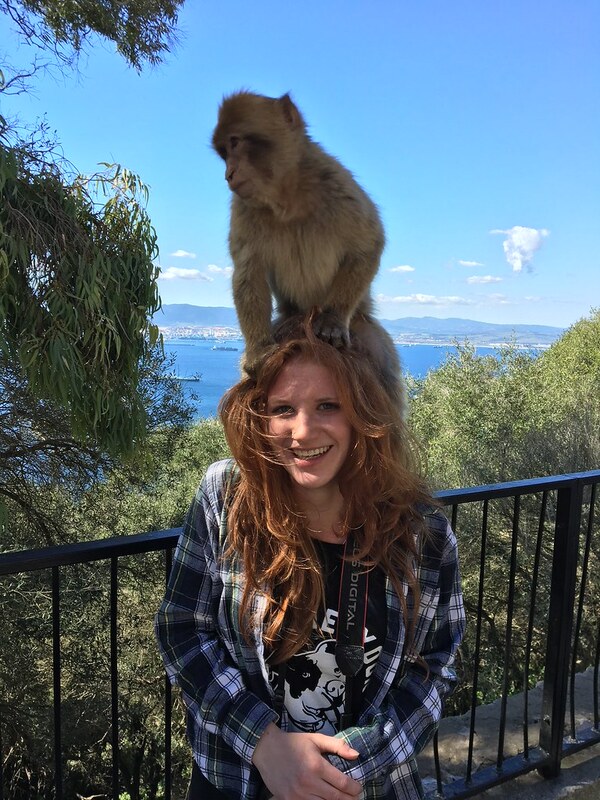 It was a pretty cool experience, though I could’ve done without the cheeky gnawing on my scalp. 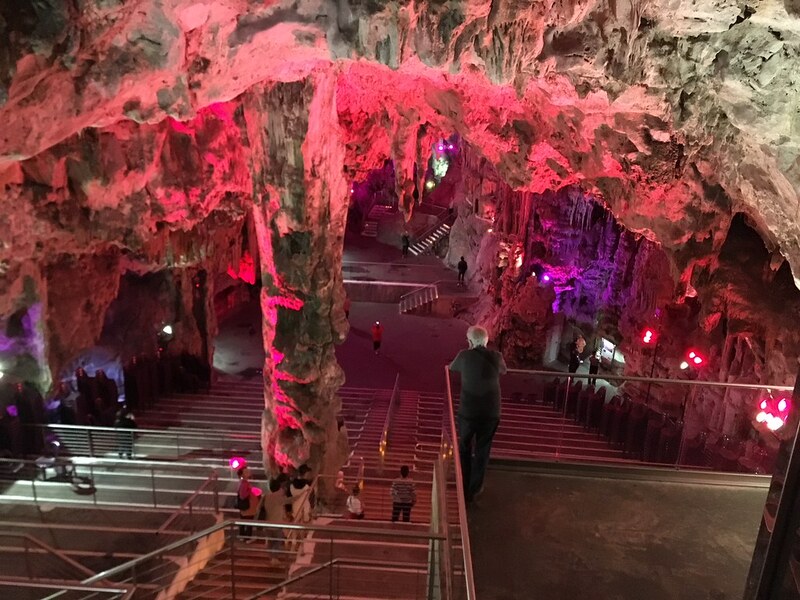 Our bus route led us to a few more traditional tourist stops, including the Great Siege Tunnels and the subterranean concert venue at St. Michael’s Cave. All in all, it was a nice break from the high intensity birding that still provided us with a little nature-based fun in addition to the cultural and architectural stuff. When we finally returned to Spain and our rental, we started the drive up into the mountains. Our sleeping arrangements were situated on the scenic cliffs of Ronda, where we enjoyed a delicious traditional meal before settling down for the night. Despite brief breather in Gibraltar, we were already back to plotting an early morning itinerary based on eBird hotspots with peak avian activity. The ride never ends! 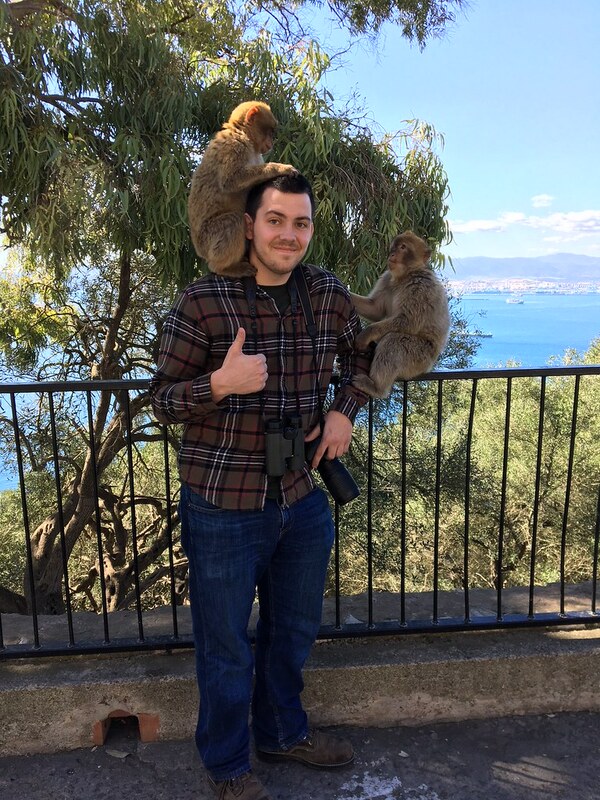 A recent graduate (Cornell '14) and lifelong explorer cataloging my thoughts and travels. This entry was posted in Nature and tagged africa, animal, animals, Atlantic, barbary macaque, bincoulars, biology, bird, birding, cadiz, camera, continent, costa de la luz, costa del sol, eagle, earth, ecology, environment, espana, flock, gannet, gibraltar, griffon, gull, life, malaga, mediterranean, migration, monkey, morocco, NATURE, OCEAN, partridge, pelagic, photography, plover, primate, research, rock of gibraltar, ronda, school, science, scope, seawatch, shearwater, skua, spain, strait, tarifa, tern, united kingdom, vulture, water, WILDLIFE. Bookmark the permalink.